Dash Core Group CEO Ryan Taylor expressed confidence that the release of digital currencies of central banks (CBDC) is “the inevitable future.” However, he added that it was not entirely clear what form these assets would take and how the market would react to their appearance. “I do think it’s inevitable. They [governments] all are going — through either competitors’ pressure or through their own desires — to launch their own cryptocurrencies. But I don’t think it is where the greatest innovations will occur,” Taylor said in an interview. In one form or another, the possibility of issuing a CBDC is being considered by a number of countries, including China, Norway, Thailand, and Iran. Venezuela has already managed to launch the national cryptocurrency, Petro. Venezuelan President Nicolas Maduro approved the cryptocurrency in December 2017. The official sales of the cryptocurrency already started in February of this year. It is reported that since November 5, citizens will be able to buy Petro on the website www.petro.gob.ve, and there will be six exchanges on the territory of Venezuela. “It is an open source code and using the word ‘plagiarize’ is quite difficult to apply, [but] there are significant portions they have copied”. The European Parliament has also made up its mind about the CBDC. A study conducted by the European Parliament's Committee on Economics and Financial Policies showed that digital currencies issued by central banks could become a guarantor of users’ legal protection due to the lack of a competitive policy to protect the rights of users in the cryptocurrency sector. Analysts also conclude that central banks may consider using cryptocurrency systems with controlled access in which they will play a major role to supplement or replace the already used currencies. However, some central banks, for example, Korea and Switzerland, believe that such a move carries risks for financial stability. The same opinion is shared by analysts of the Bank for International Settlements (BIS). A report published by a financial institution argues that digital currencies issued by central banks may become competitors to traditional fiat money, which could lead to an increase in interest rates. As the report notes, the introduction of CBDC will cause fundamental problems that go far beyond payment systems. The Bank of Japan also concluded that the release of CBDC would not improve the efficiency of the financial system. Representatives of the financial institution expressed confidence that digital currencies can be effective only on condition that central banks completely got rid of fiat cash. However, since traditional money is widely used in Japan, the central bank does not yet plan to issue a digital alternative for them. 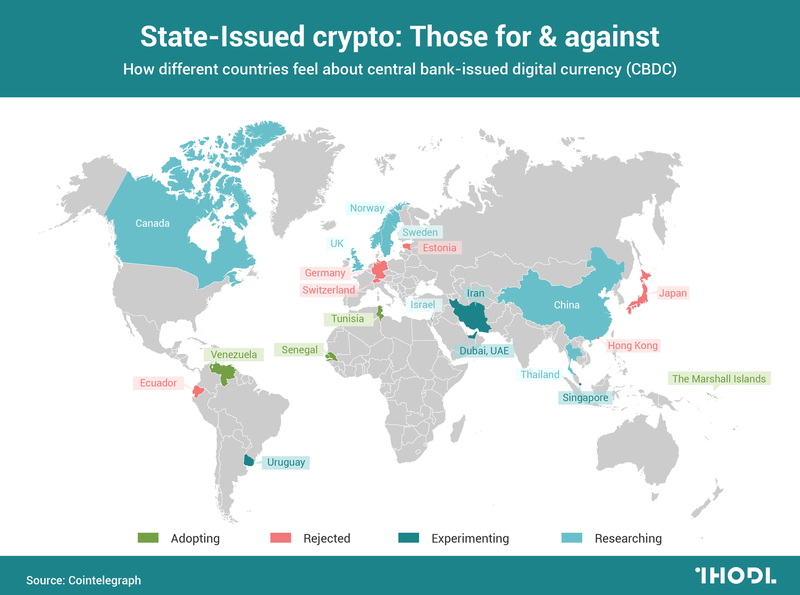 And the IMF, which had previously called on central banks to compete with private cryptocurrencies by issuing a CBDC, recently recommended that the Marshall Islands abandon such a move. The organization also published a report in which it criticized cryptocurrency.